Note:Retrograde has changed their name to Run the Red Light. Unfortunately, due to time constraints, our website will no longer be covering the group under the new name. Retrograde�s sophomore album release �This Frequency We Share� was recorded at Matchbox Studios in Austin Texas, produced by up-and-comer Dwight Baker, and mastered in Los Angeles by veteran Dave Collins (Soundgarden, Queens of the Stone Age, No Doubt). The album was released in Canada through MapleNationWide/Universal on September 13, 2005 and was just released throughout Europe on Sweden�s Atenzia Records on October 24, 2005. The first single �Letting Go� can now be heard on a number of satellite and commercial stations across Canada. A number of television productions have already picked up on �This Frequency We Share.� Most notably, numerous songs have appeared in UPN's America's Next Top Model, MTV's America or Busted, & ESPN's Offshore Adventures. On the net, �Letting Go� is currently at #1 on the Modern Rock charts at Garageband.com with 3 other songs off the new album in the top ten. Most recently, retrograde won the Molson Rock Search in Edmonton, AB. This winner-take-all contest was based on both judge and audience voting and consisted of 200 bands from across the country competing for over $200,000 in prizes including recording time, video production, photoshoots, radio play, and gear. In October 2004, retrograde released an EP entitled �Headphones� in Western Canada as a forerunner to �This Frequency We Share.� The EP had strong support from CFOX and regional radio, garnered critical acclaim from notable press such Vancouver�s Georgia Straight, and went to its second pressing within weeks of its release. After returning from almost a dozen Western Canada tours, retrograde appeared on the cover of the nationally distributed �Muzik Etc� magazine in February 2004. The cover article focused on the band�s uncanny Do-It-Yourself initiatives. Around this time, the band inked a deal with Eric Godtland Management, based in San Francisco California. The company represents a number of successful artists, most notably multi-platinum artist Third Eye Blind. Over the last few years, retrograde has directly supported bands such as The Tea Party, Big Wreck, Default, Nickelback, Bif Naked, Theory of a Deadman, I Mother Earth, Not By Choice, Big Sugar, Kazzer, Wide Mouth Mason, & Headstones. The band has also performed at some of Canada�s biggest music festivals. Alberta's �Stage 13" (attendance: 30,000 ), Saskatchewan's �Rock 'N The Valley� (attendance: 50,000 ) and Molson's SnowJam in Vancouver, BC (attendance: 55,000 ) alongside the likes of Nickelback, The Tragically Hip, 3 Doors Down, Third Eye Blind, Pennywise, Our Lady Peace, Finger Eleven and many more. 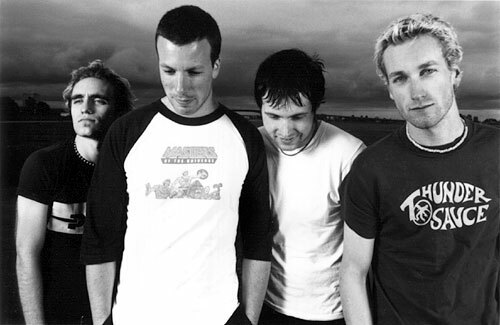 In 2001, retrograde released their self-titled debut album. The first single "Complicated" was spun on over 40 stations across Canada and charted up to #1 in some territories. The video, shot with Triton Films (Bif Naked, Edwin), received steady rotation on MuchMusic & MuchLoud. The follow up single "Caught in the Sun" also charted on rock radio across the country. Retrograde has a strong history, especially for an independent band, but they continue to look forward. The band will be writing new material in January 2006, then shooting a video for the 3rd single from "This Frequency We Share" and touring coast to coast in February and March 2006.